We have already emphasized that Mahayana Buddhism takes great exception to the earlier schools with regard to the spiritual heights to which a person can rise. To repeat, Mahayana held that all sentient beings were eligible, and that they all could attain full Buddhahood. In the Lotus Sutra, in addition to the caustic remarks towards Hinayana monks, we also find positive teachings in support of this view of universal candidacy. A large numbers of chapters are deliberately intended to make this point, using person after person to illustrate it. For example, in chapter 11 Manjushri, the Bodhisattva of Great Wisdom, was discussing this issue with another Bodhisattva, who was being skeptical. At issue was not only that many different beings could become Buddhas, but that they could do so in a very short time. The skeptical Bodhisattva brought up the experience of Shakyamuni himself. To paraphrase, "He spent aeons and aeons going through various lifetimes with total perfection. How can you say that someone could do the same thing almost instantaneously?" So Manjushri called up the 8-year old daughter of the dragon king, who usually lived under water. Note the various obstacles for her to attain Buddhahood: She was a child; she was not human; she was female. 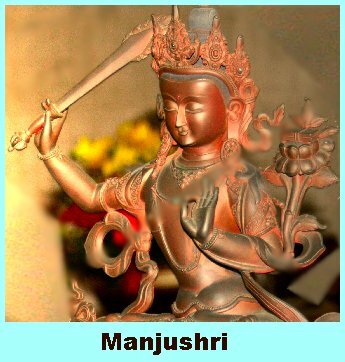 Nevertheless, Manjushri claimed that she was ready to become a Buddha at any time. She had all of the knowledge, insight, and compassion that was necessary. Then the dragon girl spoke up for herself asserting that she was ready to become a Buddha. Immediately she underwent a metamorphosis in which she turned male, became a Bodhisattva, and then, a few moments later, was glorified as a Buddha. So, despite being a non-human female child, she was not excluded. Of course, the dragon-girl was a very nice person. But what about people who appear to be wicked? And who could be a worse person than Devadatta, Siddharhta Gautama's cousin? According to the Theravada tradition, he tried to take over the sangha, Buddha's order of monks. His scheme included the assassination of the Buddha himself. Nevertheless, in the same chapter 11 of the Lotus Sutra, Devadatta receives a thorough rehabilitation.1 To everyone's amazement the Buddha predicted that he, too, would become a Buddha some day. He backed up his claim by referring to a previous life of his. In that life the Buddha was a king who was dissatisfied with his present condition of pure luxury. He offered to become the servant of anyone who could teach him the true wisdom that would lead to enlightenment. A man came forward and showed that he was up to the task. So, given the extended lifespan of human beings during that era, he wound up teaching the dharma to the eventual Buddha for a thousand years, thus contributing greatly to the Buddha's eventual enlightenment. During that entire time, the king did all the menial labor for his teacher, including fetching water and chopping wood. The dedicated teacher, who was so knowledgeable about the way to enlightenment, was none other than Devadatta in an earlier life. Thus, the Buddha concluded, we should not be surprised that he, too, was on his way to become a Buddha eventually. Other, later schools of Mahayana Buddhism make the same universal access to Buddhahood clear as well, though in their own particular way. 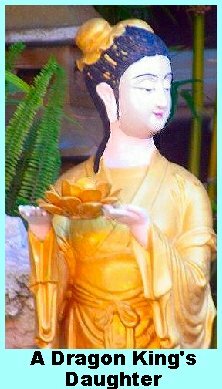 The schools based on the teachings of Nichiren Daishonin, who lived and taught in the thirteenth century AD, exhort their adherents to chant a daily salutation to the Lotus Sutra. One of the benefits of this discipline is to propel a person who does so consistently through ten levels of existence, at the very bottom of which is "hell," and a the top of which is "Buddha." Thus, by means of constant chanting over a number of years, any person can reach the stage of Buddhahood. However, we must not confuse what I have called "universal access" with "universal attainment." Just because Mahayana schools teach that any sentient being can become a Buddha, it doesn't follow that every sentient being is a Buddha. To get there requires work--hard work in some schools. The dragon king's daughter in the story above fulfilled all of the requirements of a bodhisattva in seemingly record time, but she still had to fulfill the requirements. Anyone may be eligible, but that only means that anyone theoretically has the right to work for enlightenment. It must still be earned. The difference comes out clearly in another parable in the Lotus Sutra, this one in chapter 4. A number of Sakyamuni's early disciples were addressing him, with Mahakasyapa being the spokesperson. The immediate occasion was that the Buddha had announced that Sariputra would soon become a Buddha, and Sariputra's companions, such as Mahakasyapa and Maudgalyayana, were overjoyed to hear that this honor would come their way as well eventually. This story may have a familiar ring to Christians. It is the story of the wayward son returning home and being accepted back by his father. However, the details and, even more importantly, the point of the story, is very different here from the biblical parable of the "Prodigal Son," which stresses God's unconditional love and grace (Luke 15). Here the emphasis is on the long time that the wealthy man had his son work for him before disclosing his identity to him. In the Lotus Sutra the story begins when a man's only son gave in to various enticements and left home to seek his fortune. He did not find it, but instead dropped to the very bottom of society. He became a vagrant who was poor, hungry, filthy, diseased, and, needless to say, highly unhappy. He wandered from town to town, most of the time living on what little he received by begging. His father, on the other hand, achieved a high level of material success. He had moved to a different country, where he enjoyed all the good stuff that comes with having more money than you know what to do with. In his meanderings, fifty years after the original split, the son happened to reach his father's mansion with its surrounding estate. He did not know that this was the father's new residence, and he did not recognize him. He only saw a pompous old man directing various activities that would undoubtedly increase his wealth even further. The son was smart enough to recognize that he did not belong there, and that the chances of his receiving any food were extremely low. More likely, he feared, he would be pressed into slave labor with no compensation whatever. Consequently, after looking at this opulent property for a few minutes, he decided that he was better off trying to find some minimal nourishment in the nearby village. He turned around and headed back the way he had come. However, even though the son did not recognize the father, even with such a short glimpse, the father was pretty convinced that he had just seen his son. He sent two of his men after him to bring him back. They were not to identify themselves or disclose anything else that might reveal any connection between son and father. Their only only message to him was that someone had a job for him, and that he would receive food in return. Here it is where the biblical story and the one in the Lotus Sutra really diverge. The father assessed that the son was not yet ready to be recognized as his son. He probably would not accept it as a fact, and, in any case, he was in no way fit to assume the position of heir to this luxurious estate. So, he put him to work shoveling manure. The sutra is quite explicit in describing how disgusting the material was that the son had to clear away. And he continued to do so--for twenty years.2 He slept in a hovel outside of the stables and received his daily ration of food, and the father left things that way for two decades. It was only when he was on his death bed that he made the public announcement that this man was his son, and that he was about to inherit all of his father's wealth. The son, having qualified himself by then, was overjoyed to hear this news and accepted his new position. 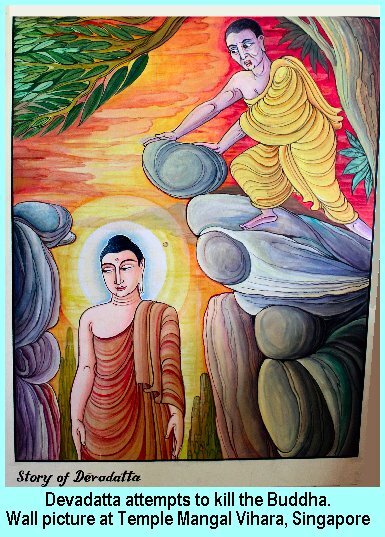 Mahakasyapa then concluded by thanking the Buddha for clarifying that, just as the son had to wait for twenty years for his new standing, the disciples like Sariputra and he could expect a long wait, but that eventually, no matter the length of time, they would receive Buddhahood. 1 Some writers believe that, whereas Devadatta was a bad person in the Theravada tradition, the Lotus Sutra did not think of him in that way. But that's missing the point, which is also supported by the way in which Devadatta's name is introduced in the Lotus Sutra. The idea is that Devadatta has, indeed, made a bad name for himself, but he could become a Buddha despite his present notoriety. Unless one starts with the assumption of his appearing to be totally unqualified for Buddhahood, the chapter does not make sense. Back to text. 2 Clearly, this is merely one of a number of cases of the Lotus Sutra using deliberately exaggerated numbers in order to make a point. If we assume that the son was born when his father was eighteen years old, and that he left home when he himself was eighteen, the father would have been 36 by that time. At the reunion 50 years later the father and son would have been 68 and 86 respectively. Then, if we add the son performing hard labor for twenty more years, he would have been 88 years old when his father died at the ripe old age of 106. From the perspective of what counts as a usual life span nowadays, there is a hint of improbability about these numbers. But what we have here is a parable, and no one is making any claims that the story represents actual facts. Back to text.